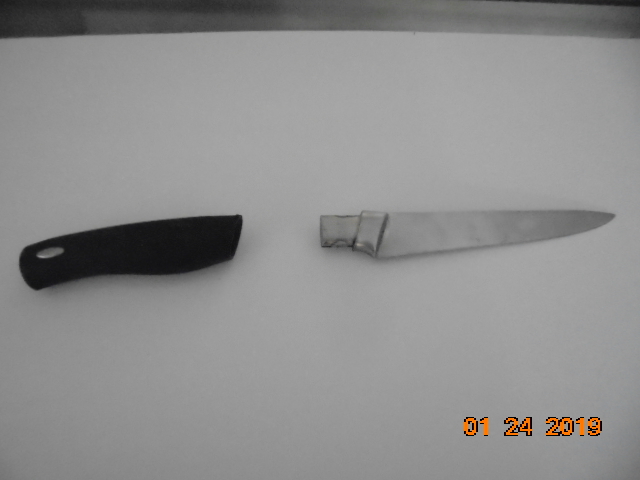 I have an OXO kitchen knife that the handle came off. I don't think anything broke but there was a gooey substance inside the area where the blade was attached to the handle. The rubber handle has a metal tang molder inside where the blade attaches and the blade has a corresponding slot in the mounting tang. Any ideas on how to re-attach the handle and blade? I can post pics if that will help. I have an email into the OXO company asking for help but I thought I'd ask here too. Pics would definitely help, sounds like the glue failed? Ok looks more like a weld/solder joint failure, best thing to do if possible would be to get the piece still in the handle out and re solder it and then put it back together again. A second option if that’s not possible is to put the blade back in and drill a couple 1/8” holes through he blade tang and remaining handle parts and pin them together, but I’m not sure that would do the comfort of the handle any favers. Maybe have someone weld on a tang and put proper scales on it? Oxo uses fairly good steel, but they cheap out on another $0.18 for at least a half tanged knife. 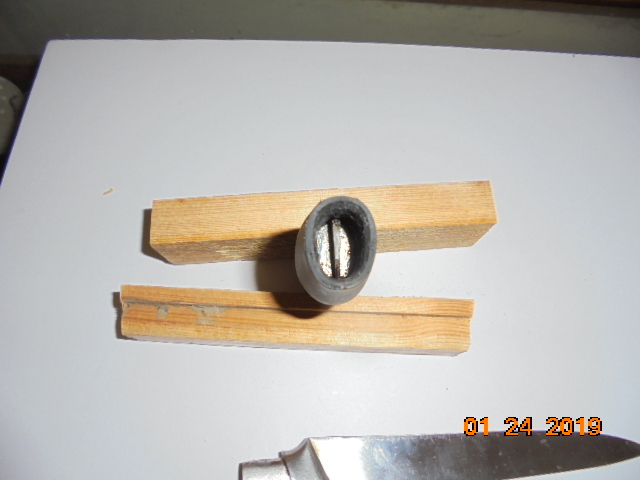 Dylan, there is no visible broken weld, the tang in the rubber handle is molded in and fits in a slot in the blade tang. There was some brown gooey stuff in the handle and the blade tang and slot. I guessed it was knife makers resin but it doesn't seem like any way the handle can support the blade with just resin. John, that could be another option. 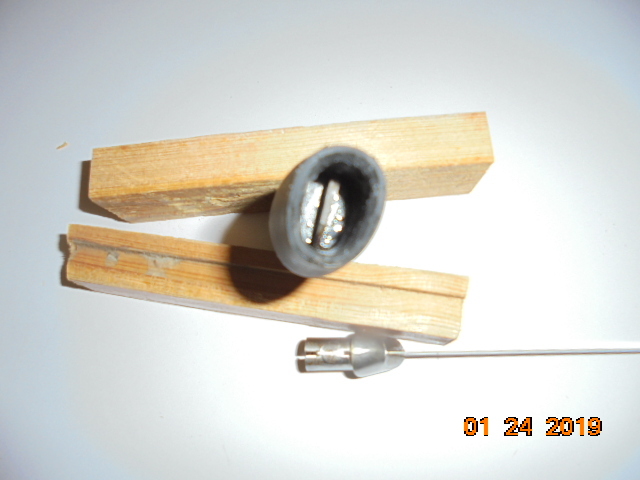 I would try to epoxy it back in place and drill a hole for a pin or two. You could make the pins just a little shorter than the thickness of the handle so they wouldn't protrude and poke your hand. If that doesn't hold up you could try JW's suggestion of a welded tang. That might work if you can keep the heat from getting into the blade and ruining the temper. id clean the tang and handle really well . rough up the tang and use brownells glass or some premium 3000 psi 2 part epoxy to put it back together. Thanks guys. I was thinking an epoxy or JB Weld. I've had the 2 halves soaking in hot water and Dawn. That has gotten lots of the goo out. I'll try alcohol or acetone to degrease and clean better. I have an email into the company but haven't heard back. 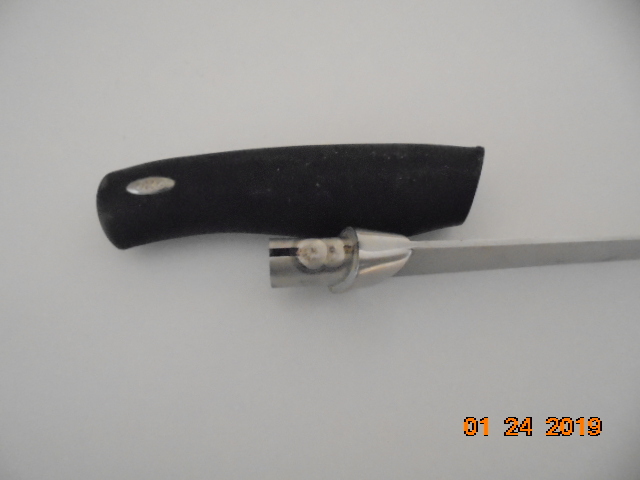 This sure looks like a weak handle/blade attachment for a well used kitchen knife. I'm not positive that's the best thing to do, but it is exactly what I would do. The gap-filling potential of the JB Weld will make up for the potential run-out that would happen with a thinner epoxy. The construction is not very impressive, but the tool can be made about as good as it used to be, at least. I used JB Weld and it seems to be holding just fine. We'll see. I sent an email to OXO Knives asking for repair suggestions. They sent me a new knife, not the same model but a new knife anyway.